This ULTRA creamy coconut sweet potato curry with sweet potato noodles recipe is a SUPER quick and easy weeknight dinner that’s gluten free and paleo/vegan friendly! Are you one of those people that goes to a restaurant, finds the dish you LOVE, and then NEVER EVER EVER orders anything else off the menu there ever again because you COULD BE LET DOWN? Some may call it “boring.” Some may call it “not living on the edge.” But you know what I call it? Why would I risk paying for a plate of LIES AND DISAPPOINTMENT when I know that I could face plant into a plate of things that I want to eat ALL THE TIME. And that was me with this pasta. Back in the land yonder north where I grew up – you may know it as Canada – there was this ONE restaurant that made the BEST Coconut Curry pasta. I L-O-V-E-D it with a capital LUHVE. Every time that I visited this little spot, I looked forward to the much needed spoon to face action that I knew awaited me. I got MARRIED. And my husband was AMERICAN. And he MOVED ME OUT OF THE COUNTRY. Gone were the days of my evenings tangled up in soft pasta, fresh, crisp veggies, creamy sauce and all wrapped up with a bright, sweet mango chutney. The things that we give up for love, you know? That was 2 years ago now, and those evening trysts with my noodley goodness were still running through my head. Sidenote: That was a lot creepier on Word than it sounded in my brain. But, you understand. Clearly, it was time to stop dreaming, and start LIVING. Take the bull by the HORNS. Or the taste buds by the curry. I started with the sauce. It needed the perfect balance of sweet coconut milk with JUST the right POP of curry powder. It also needed the crispety vegetable experience that I knew to be true of my beloved dish. Broccoli, onions and peppers simmered away, absorbing all the FLAVAH. The excitement grew. 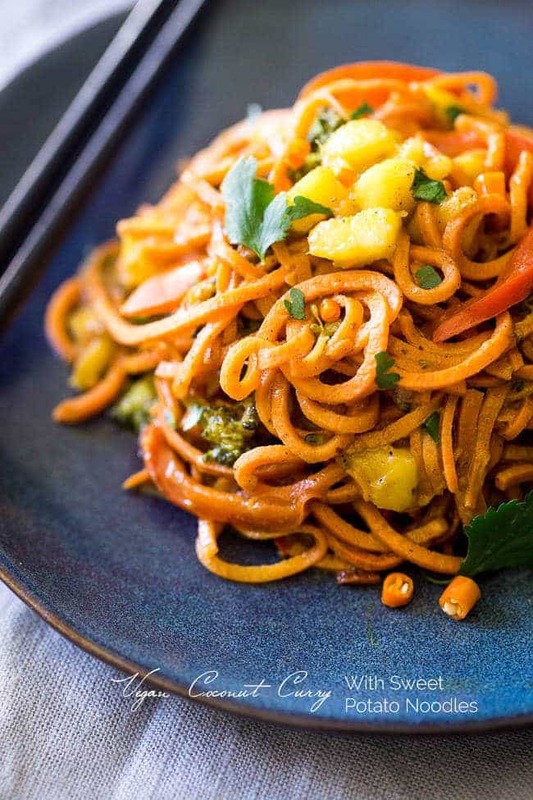 Onto the noodles in this Coconut Sweet Potato Curry with Sweet Potato Noodles. I debated using a gluten free sweet potato pasta, but there was also my current obsession with making spiralized sweet potato noodles. Do you remember them in the creamy healthy carbonara with sweet potato noodles? JUST SO GOOD. Cook the noodles uncovered in the hot oil, stirring very often, until they JUST begin to wilt, but still have a slight crunch. This takes about 7-10 minutes. At this point, you can season them with salt and add them into your recipe! Sweet potato coconut curry? CAN I GET A YES PLEASE. Really though, ANY coconut curry makes my <3 <3 <3 beat just a little bit faster. Coconut curry with almond butter, Lentil Coconut Curry or even Green Coconut Curry Bowls. Sometimes I like to even get crazy and ADD FRUIT like in the Thai Pineapple Paleo Chicken Curry with coconut milk! All the curry with the da coconut for ME PLEASE. BUT, pack to the Coconut Sweet Potato Curry with Sweet Potato Noodles at hand. I put it on my plate and topped it off with the world’s easiest mango chutney, and took a bite anxiously. Would I continue to secretly regret my immigration? Would I still have the desire to move closer to my beloved bowl of noodlies, which could eventually lead to pasta-withdrawal-induced marriage counselling? Well, my peeps, I am happy to report that the future is looking bright for my marriage. And even brighter for my taste buds. I shared the Sweet Potato Coconut Curry Recipe on Food Fanatic, so make sure to check it out there too! THIS is my favorite spiralizer! 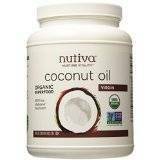 Taylor – I’ve never had coconut curry, but all of the flavors in this recipe are favorites! There are certain restaurants that I go to where I won’t branch out either. I’m not picky, I just know what I like. 🙂 I hope you have a fabulous weekend. WHAT?! Oh man Erin, you need to remedy that…it’s the best kind of curry!! I am glad it’s not just me 😉 Have a great weekend and thank you! I’m so glad that you were able to recreate your favorite dish, Taylor! This looks fantastic! I love the sound of sweet potato noodles, too. Pinned! They are so good Gayle! Thanks! A simply stunning spiralized dish! Love coconut, curry, and sweet potatoes so this is must make! That mango salsa just puts it over the top! Thank you so much Rebecca! You’re the best! But think if you never moved to the states, all the yummy food you would have missed out on! Ha. I will gladly take a BIG bowl of this anyday! Pinned! Haha! VERY true!!! Thanks woman! Just yum!! I love anything sweet potatoes and now I am dying to try them in noodle form – it just looks delicious Taylor! You would totally die for them in noodle form girl! Thanks! A plate of lies & disappointment is just the worst, girl! Totally feel ya. I need to make this ASAP, looks toooooo dang good. This looks like such a great meatless Monday meal. I love how light it is but still has so much flavor. 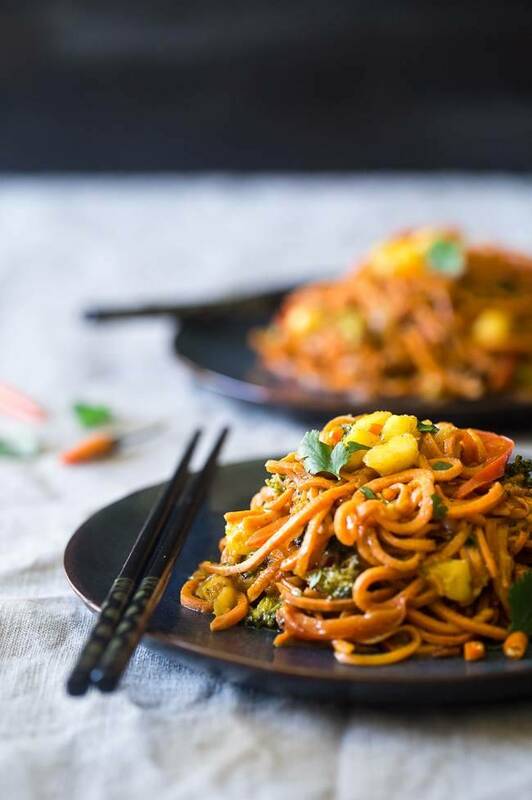 Love the idea of sweet potato noodles for curry 🙂 Looks delish! DRooling! literally! pinned! I am totally trying this! what kind of spiralizer do you use for these “noodles” ? and I am SO the same I always order the same things, causeee it is SMART! I like to know I’m gonna leave there happy not still hungry cause it was ish! HAHAHA happy Friday girl! Thank you Michele! I am so glad I am not the only one that orders the same thing! This looks delicious! I JUST got a spiralizer last week for my birthday and I’m spiralizing sweet potatoes like crazy. So good and so pretty! RIGHT! I can’t stop either! Thanks Becky! Oh I will give you a YES PLEASE!! These noodles are amazing! That sauce sounds incredible! Thank you Cate! Hope your weekend is great! YUM…..love me some of dat! I LOVE sweet potatoes and often use them to make pasta sauce, using them as the actual noodle is a great idea! I hope you love them Sofia! Thanks! This looks AMAZING! It combines so many of the things I love…curry, coconut milk, sweet potatoes…yum! Pinning, thanks for sharing! Wow, this looks so yummy, my mouth is watering, and I missed my lunch. Oh man, sounds like you might need to make it! 😉 Thanks Celeste! Yum Taylor! Now I know what I want for dinner this week! Canada is where it’s at! 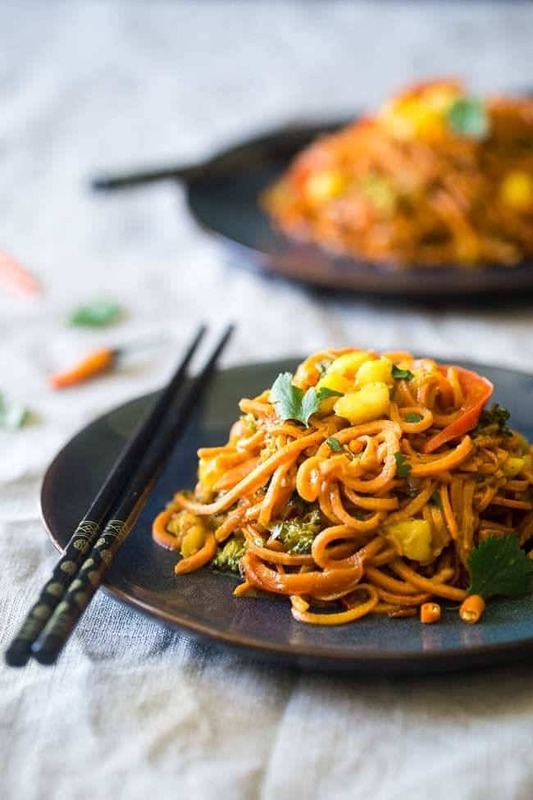 Fellow Canadian over here 🙂 I’m normally not a fan of curry but this sounds delicious, and I love my spiralizer soooo I’ll be making this for sure. WOOO! Where are you from?! 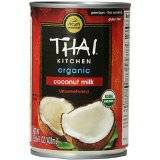 Coconut curry is SUPER mild and a great place to start for “curry haters!” Let me know if you try it! Thanks Megan! What is the name of the restaurant called? Please tell me its in toronto! I really want to try it! Definitely going to make this one and coconut currys are the best comfort food . Unfortunately it’s only in British Columbia, it’s not a chain – sorry! Thank you so much Jo, please let me know if you try it! I am eating this right now! What an amazing idea to use sweet potatoes noodles. Absolutely perfectly delicious! Thanks for the recipe! I think I could eat this everyday! Woo hoo! I am so pumped you love it Loretta! Thanks for letting me know! OMG Taylor! I just had this for lunch and it was killer! It’s so quick and so bright and flavorful. Thanks so much for the wonderful recipe! WOO HOO! I am so glad you loved it! Thanks for letting me know Lauren! This sounds delish! Question though…I have a hand spiralizer. I would think the sweet potato would be too hard to twist thru let alone a big one. I really want to make this but don’t know if my spiralizer or my hand can do it. What do you think? 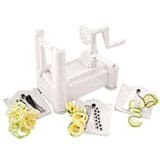 Hmm, I actually can’t REALLY tell you as I have never tried a hand spiralizer before! I do think it might be pretty difficult though as sweet potatoes are so hard! 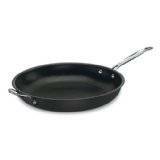 You could just slice it really thin and pan fry it, and serve the sauce over? It wouldn’t be EXACTLY the same, but pretty close! I hope that helps! Please let me know if you try it! Juste une petite question : quand on ne comprend pas l’anglais on fait comment pour les recettes, elles sont appétissantes et c’est frustrant ! I’m sorry, I don’t understand French! This is the second recipe of yours I have tried this week! I just bought a new spiralizer and this was my first go at it! Wow! The noodles alone were amazing! My husband and I devoured this (as you instructed)!! Thanks for another amazing recipe! I am so glad you love them! Sweet potato noodles are my favorite, and this is one of my fav recipes as well! Thanks for sharing!!! Thank you so much for this delicious recipe! Made it two days ago and my family is already requesting it again! I am so happy you loved it Cindy!! Thanks for letting me know! What a colorful and delicious looking dish! I love spirilized veggies and this looks like the perfect fall dish! Pinning to shae. Thank you! Thank you so much for the love and pin!! Taylor, this is a beautiful combination and of course loving the #killeringredients! Happy to share this and make this very soon. I made this dish tonight for the first time and it was absolutely delicious! Thanks for a “keeper” recipe. I am SO happy to hear that Jennifer! Thank you for sharing!! This sounds SO delicious! Yum. Oh my tastebuds! This was so amazing. I’m so glad I doubled the recipe so we could have leftovers! I admit I did cheat and buy a premade mango salsa that my local grocery store makes because it’s delish. This was delicious and Hubby agreed! My only change was that I used lime juice instead of the ACV for the Mango Salsa, as well as adding a good squeeze of lime in the curry. Thanks! Thanks so much for sharing this, Taylor! I love me a good curry and this one looks just perfect. I haven’t yet tried using a spiralizer, but I’m pretty motivated right now. How do you feel about pineapple? I bet it would be delish!! You are so welcome! I hope you love it! 🙂 Happy to have you here! Hi, pinned this and want to make soon. But a little hesitant to try it with yellow curry because the hubs says he only likes red. So, do you think i could substitute red for yellow curry? If not, i guess i could try it as is and see what happens! If he dislikes it Ill just have to eat all of it???? Honestly, I really don’t. But, I also don’t like red curry haha! But, if you try it please let me know what you think! I made something similar to this a couple of weeks ago. Your recipe was the inspiration. The flavors are perfect together! I love when sweet potatoes can be used in alternative ways. They are such a hearty and healthy vegetable. They have street cred. Right? So good, thanks for sharing. A friend just asked me for a recipe using butternut squash noodles, so I recommended this one using the squash noodles in place of sweet potato. I bet it would be good too. 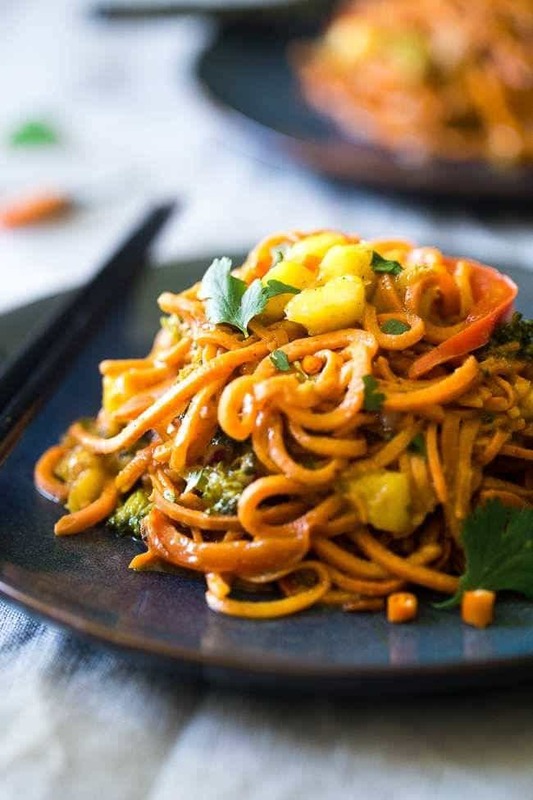 sweet potato noodles are delicious and the coconut curry sauce sounds so delicious! Can’t wait to try it out! I hope you love it Jess! Thanks! Just tried it! Delicious! I added a couple of chopped cashews to give a bit of crunch to the recipe! Love it!! SO happy you love it! Thanks for letting me know! WOW!!! thank You for a truely scrumptious recipe!! Will be making it again and again!! Not sure on your curry powder but I had to add three or four times the amount to mine lol.. also added some bean sprouts to the curry near the end… a healthy curry to die for!!!! Strange! I’ve never had anyone have that curry powder problem! But, glad you liked it! Going to try this tonight with my new spiralizer. Has anyone frozen this dish? Does it freeze and defrost ok? I haven’t frozen it! My gut is that it won’t work so well though…but let us know! I’ve made this recipe several times already and am making it once again. It’s definitely in my regular rotation of recipes. I am in love with my spiralizer and after years of only being served Thanksgiving-style sweet potatoes (you know, the sickeningly sweet marshmallow topped crap claiming to be yams or sweet potatoes), I never ate them. I developed a real love for them recently, though, as long as they are made just about any other way. I even have a recipe for vegetarian burritos that have sweet potatoes in them and I can’t get enough of those! I’m sharing this recipe yet again, and my daughter’s boyfriend will be trying it for his first time. I think he’ll fall in love with this recipe, too! 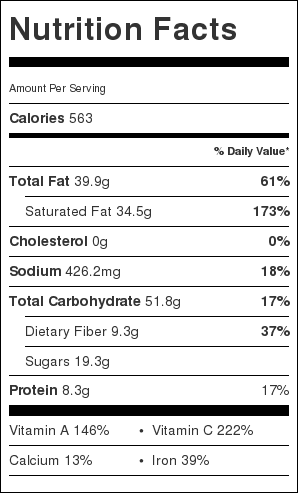 EWWWW…those sweet potatoes ARE CRAP! Made this dish, it was delicious. I didn’t make the mango salsa because I didn’t have any of those ingredients. I did add about a tsp. of red pepper flakes to spice it up a bit. I was afraid it was going to be bland when tasting the sauce, but it was added to the sweet potato noodles it added just the right amount of extra flavor. My red peppers and broccoli did come out a bit mushy, so I might not let them cook so long in the sauce next time and add them back to the pot closer to the end. Great to hear Jennifer! Good to note on cook time. Just made this scrumptious meal for dinner and the only negative was that the quantity was too much. I used the recipe exactly as written but used a mild curry powder and just a couple drops of schricha in the salsa. It was totally not spicy for my hot spice intolerant husband so don’t let this one scare you off if that is a concern for you. I topped it of with a handful of cashews. Yay! I am SO glad you loved it! 🙂 Thanks for commenting! This recipe was simply delightful. I served it in place of the traditional coconut rice to accompany a Philippine chicken adobo and it was a hit with everyone at the table.